GREEN BAY, Wis. (CNS) — The first day of winter, Dec. 21, is also known as the winter solstice. It is the shortest day and longest night of the year. For people who are homeless, it’s a night that represents the harsh challenges of living on the streets. For the past seven years, St. John the Evangelist Homeless Shelter, a ministry of the Diocese of Green Bay, has sponsored an interfaith memorial prayer service to remember local men and women who have died while homeless. The service is part of Homeless Persons’ Memorial Day, which has been sponsored nationally by the National Coalition for the Homeless since 1990. Green Bay’s memorial service began near the entrance of St. John the Evangelist Church with a candlelight prayer service and circle walk. The walk was led by members of the Open Heart Mindfulness Community, a Buddhist Sangha community. 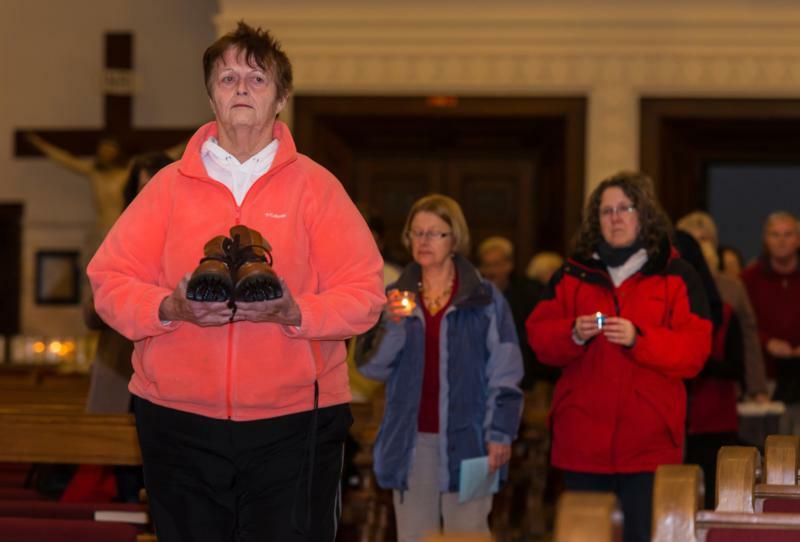 A procession into the church featured men and women carrying candles and a pair of shoes or boots representing each homeless person who died in the Green Bay area in the past year. Susan Perrault, a member of the St. John Homeless Shelter Ministry Team, said 12 people, whose names were submitted by the Brown County Housing and Homeless Coalition and other sources, were remembered at the service. A 13th candle was lit to remember all those who died and whose names were unknown. Deacon Tom Mahoney, on behalf of the parish, welcomed the group of about 145 people to the church. “We appreciate your involvement tonight to join and share in prayer, song, stories and reflections,” he told those gathered. “Let us remember to give thanks for the progress made” in addressing homelessness. In particular, he cited the shelter and its newest program, the Micah Center, a daytime resource center for men and women who have no home. Sister Judy Miller, a Sister of St. Joseph of Carondelet and member of the shelter’s board of trustees, offered a reflection about her experiences. She said her time at the shelter has been positive and she saluted the shelter guests who attended the service. “I want to thank you . . . for the ways you have influenced my life,” she said. “This is the longest night of the year. As light will soon penetrate the darkness, may we take seriously those prayers that we sang in the opening hymn when we voiced, ‘Show us Christ in one another. Make us servants strong and true. Give us all your love of justice so we will do what you would do,'” she said. Sister Judy offered a few ways that people can address homelessness. Guests were invited to share remembrances of men and women they knew who had died homeless in the past year. Bernie Schmitt, a volunteer at the shelter, was among those who spoke. He recalled a man at the shelter, Randall, whom he came to know and love for his compassion. When his friend died, Schmitt spoke to the man’s mother and he said she told him to donate his belongings and take what he wanted.